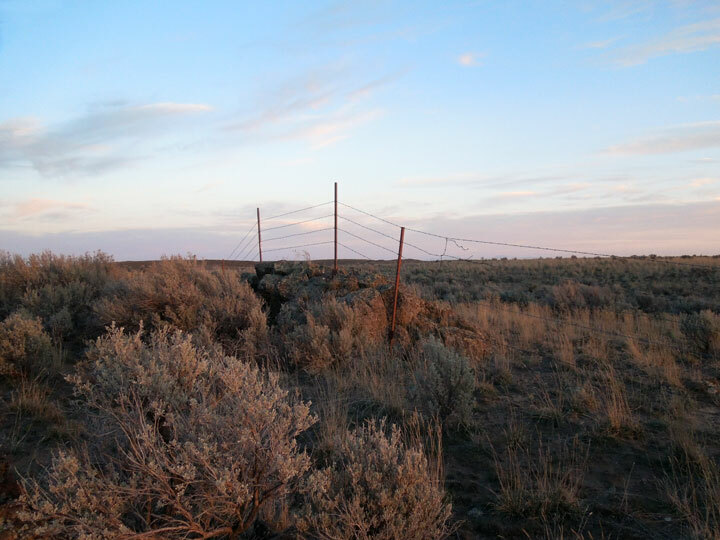 Birders across Idaho are participating in the Idaho Conservation Partnership 2015 Short-eared Owl Surveys and luckily I got on board in time to be assigned one of the survey grids. 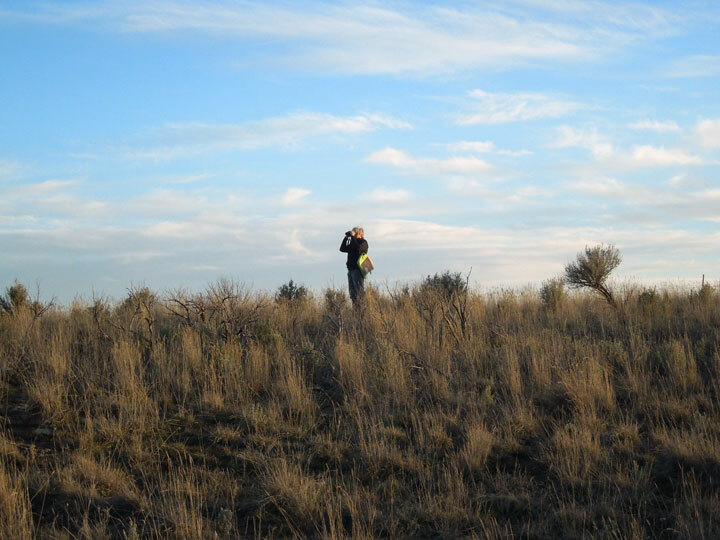 Rob Miller one of the research biologists at the Intermountain Bird Observatory in Boise, Idaho is heading up the Short-eared Owl Survey project. There are a total of 79 grids across the state of Idaho and Rob had no trouble locating volunteers to complete one survey in March and a second one of the same grid in April. My grid is #47 and it begins 5.8 miles east of Dietrich, Idaho. Each grid is 6.2 miles square and the protocol calls for a five minute observation of the surrounding habitat at a minimum of eight point count spots with a maximum of eleven. The survey should begin twenty minutes after the onset of civil twilight. The survey points are located every half mile along a five mile stretch of road within the grid. At least eight points must be completed in 90 minutes, once darkness sets in the count must stop. Highway 24 runs right though grid #47. 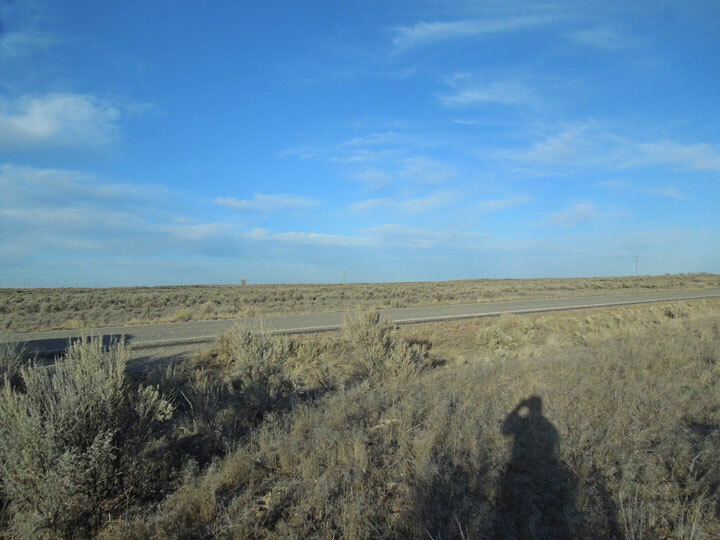 Highway 24 is not a busy thoroughfare so it is safe to pull off to the side to conduct a bird survey. I travel this road at least twice a month and have seen Short-eared Owls on many evenings. On several occasions I have pulled off the road to enjoy the sight of one or two of them silently drifting overhead like giant moths canvassing the sage brush steppe for their next meal. Rob has requested that we submit some photos of the habitat that we survey. If possible, he also wants pictures of the Short-eared Owls that we see. However, now that I have completed a survey and have experienced how rapidly the time flew by I wonder how I could control my love of photographing owls and stay on task! This remains to be seen. On the evening of March 7th shortly before civil twilight my friend Marian and I arrived at the starting point of grid #47. I was thankful that she had agreed to accompany me because having a driver that would also assistant with time management was a big help! At point #1, a short distance from the vehicle I found the best vantage point of the area and at 5:23 p.m. on the dot I began scanning the surrounding area. 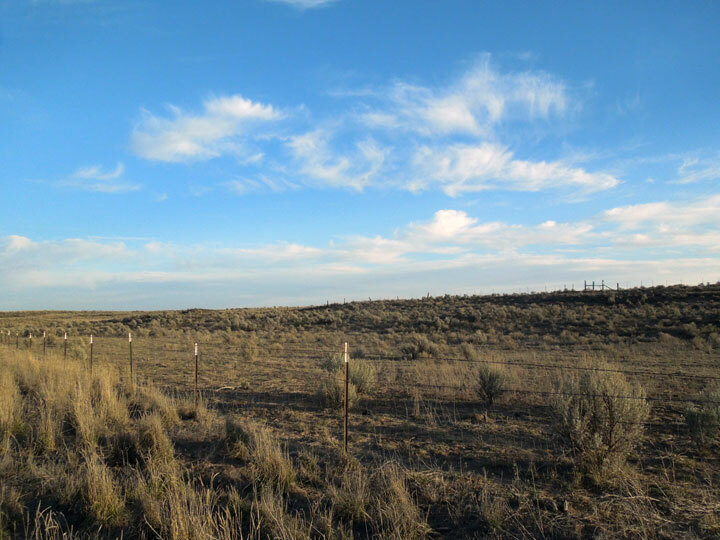 My scanning included the ground, the tops of the sage brush and the sky for the presence of any Short-eared Owls. I examined the area using binoculars, my naked eyes and I was of course listening for Short-eared Owl hoots, barks, screams, wing claps and bill snaps. My time at point #1 was uneventful – – no Short-eared Owls were seen here. At point #2 my search of the terrain was accompanied by the evening chorus of a large number of Western Meadow Larks and the first hints of pink sunset light touched the clouds. I saw a Northern Harrier here and also saw and heard my first of the year Killdeer. I hadn’t seen any Short-eared Owls at point #1 and I didn’t see or hear any at point #2 either. I made note of the Northern Harrier on my data sheet as we drove point #3. Documenting of other raptors is required. At 5:46 p.m. I began point #3. Scanning to the north I spotted something light in color and studied it hard. It was a Short-eared Owl perched on a sage brush! With great pleasure I added the owl to my data sheet and noted that it was observed during minutes 4 and 5 of the five minute count. The owl was way too far away for any kind of a photo and in my excitement I spaced taking any pictures of the area. At point #4 Marian took a picture of me intently searching for Short-eared Owls. 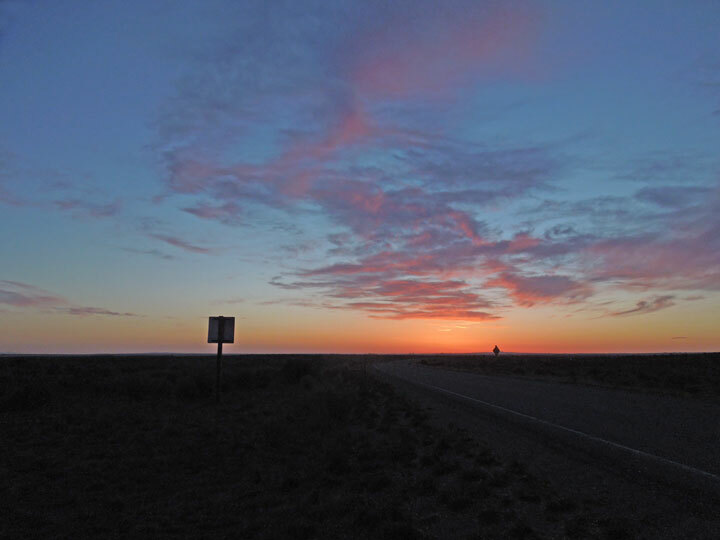 We continued east on highway 24 making the prescribed stops for the survey as the sun dropped lower and lower in the west. 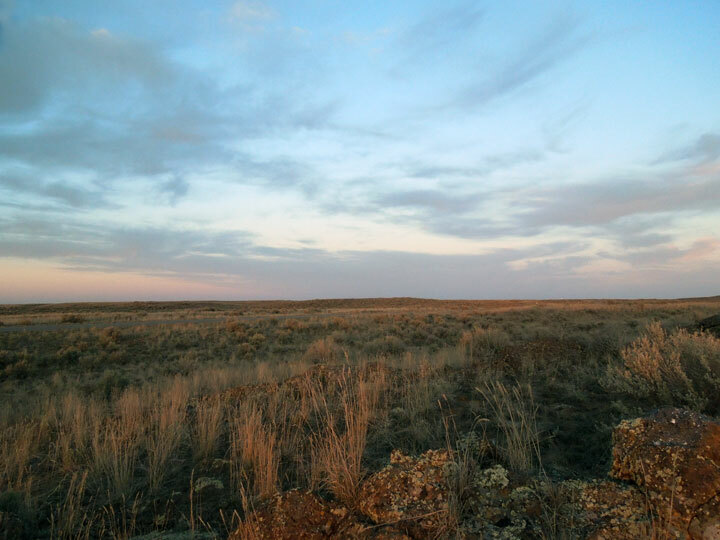 The calls of Horned Larks joined the sunset chorus of the Meadow Larks and coyotes howled to the south of me. Meanwhile, voles darted back to their burrows, but a Short-eared Owl was not the cause of their frantic dashing about, it was just me! At point #7 the tint of the light of the sunset made the features of the desert glow. By the end of the five minute survey at point #8 the sun had nearly completely set making it clear that #8 would be our last point of this survey. I was glad that I had observed one Short-eared Owl at point #3 and wondered if the other birders out on this beautiful evening had seen some too. I must add though that I was a bit disappointed that I had not seen any hunting or displaying since I have seen them so often at this time of the year right in this very area. But then, that’s birding and truly our efforts had paid off, we had not dipped. There was one Short-eared Owl visible at point #3 and heaven knows how many more were around but were not apparent. I have been so lucky in the past to have experienced some very special moments with Short-eared Owls. Perhaps you have too and this image will bring back that wondrous experience. 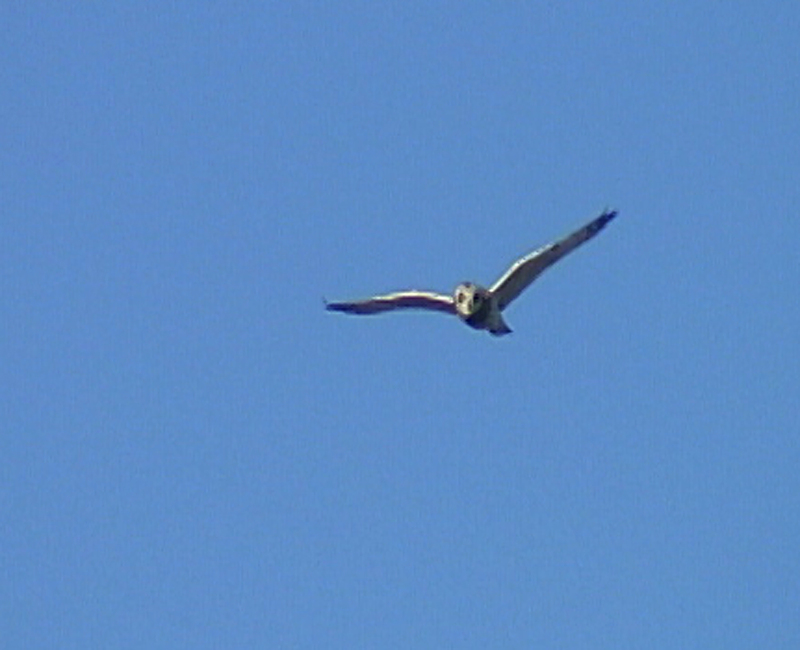 For those of you that have never seen a Short-eared Owl in flight here is a lifted frame of video. The Short-eared Owl in this frame was in the midst of displaying for its mate. I would dearly love to witness this glorious flight again sometime. A few of the birders that completed their counts earlier in the first week of March saw Short-eared Owls displaying. Maybe next time I will be one of the lucky ones! I look forward to heading out again in April to grid #47 to complete the second and final count for 2015. I will let you know how it goes.